Blount Fine Foods, located in Warren, Rhode Island is a prepared foods and soup manufacturer that produces wholesale frozen and fresh soups under the Blount brand as well as Panera Bread and Legal Sea Foods. 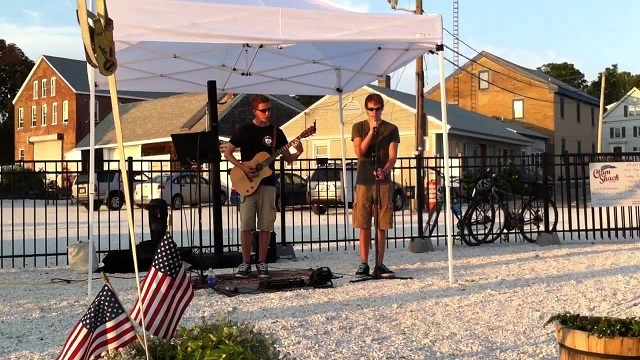 Blount Clam Shack, adjacent to the Blount headquarters provides fresh seafood and live music for the local community. Because of how densely populated this area is, complaints of excessive audibility of music from the neighbors were on the rise. To address this, Blount Fine Foods contracted David Coate Consulting (DCC) to analyze the situation and provide sound control recommendations. This is an addendum to our September 6, 2017 study report. 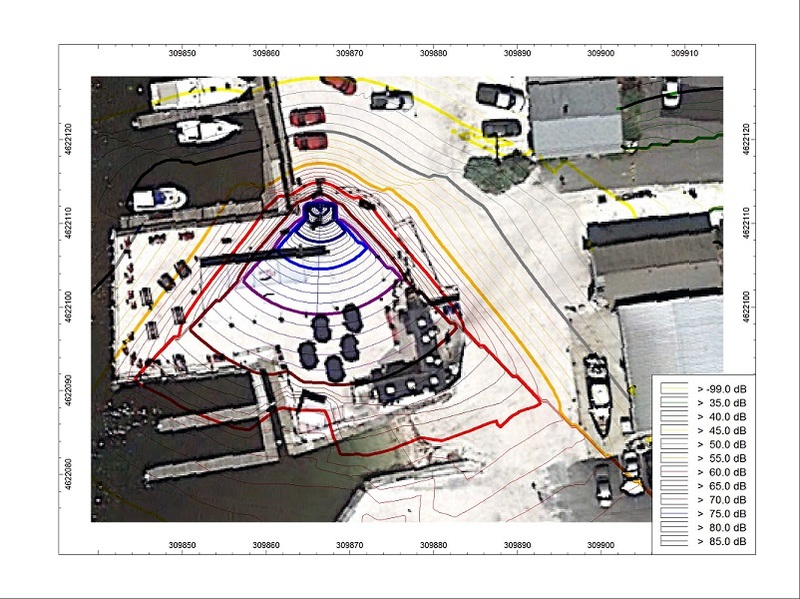 The original report identified a distributed loudspeaker sound system to reduce sound impacts to the adjacent community. This method incorporates several small loudspeakers, with reduced volume, to provide adequate music levels for patrons while reducing off-site sound levels. While this method is viable, after further consideration it would be perhaps overly complicated, especially considering the temporary nature of this outdoor sound system. DCC also evaluated highly directional loudspeakers which would aim the sound only at patrons, but commercially available directional loudspeakers are mainly geared to the museum exhibit market, with intentionally low sound levels and not suitable for music sound reinforcement. We also investigated the concept of inverting the phase of two loudspeakers at low frequencies to cancel out low frequency sound behind the stage, but again this approach is probably too complicated for a temporary sound system/music venue. The simplified method being proposed at this time incorporates a “wave-guide” approach which would aim sound primarily at patrons via a partial solid enclosure. The enclosure would be somewhat massive, preventing sound from going behind the stage, and the enclosure opening would be relatively small which would result in a fairly tight “beam” aimed at the audience. 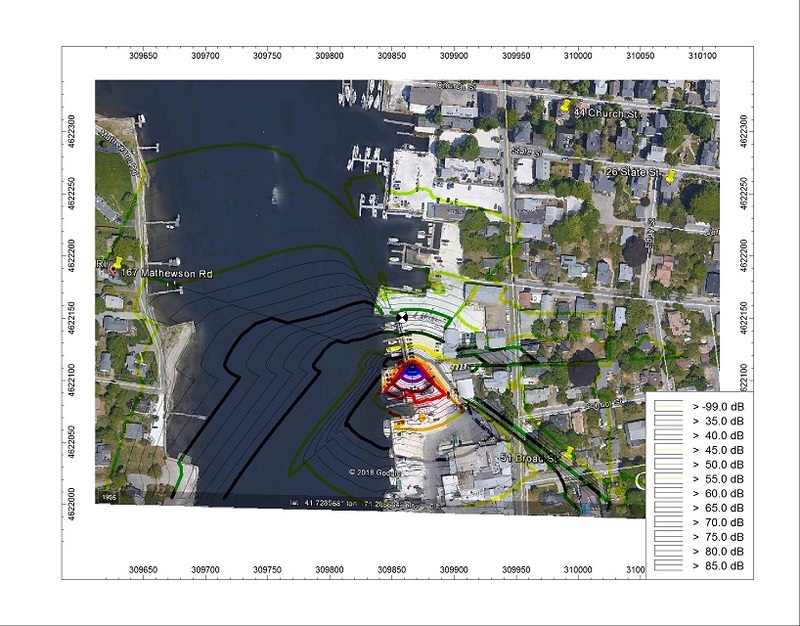 The orientation of the enclosure would aim sound in a southerly direction, away from residences. 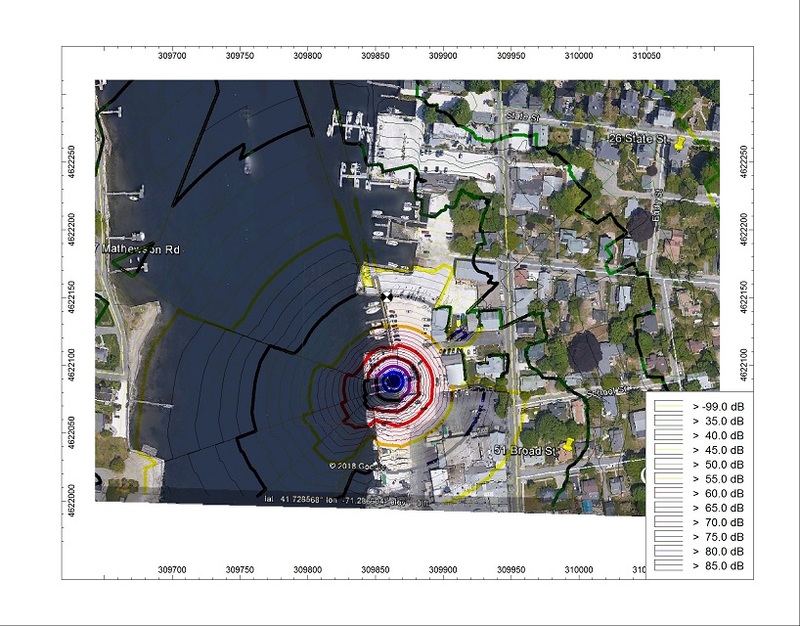 CADNA, an internationally accepted environmental noise software application was used to acoustically model the enclosure. The sound system used for the analysis consists of a single QSC K10 powered loudspeaker system. This loudspeaker is full range and suitable for music applications, but I am specifically recommending that no subwoofer be used since subwoofers are typically omni-directional and therefore very difficult to control. The K10 is assumed to be on a stand only 1 meter off the ground and near the back of a 12’ (long) by 7’ (deep) by 8’ (high) enclosure. The open 12’x8’ area would face south towards the audience. Calculations show that the enclosure will need to be at STC 33 to sufficiently reduce sound penetrations through the material. STC 33 translates to about 10 lbs/sqft which would be approximately 4” thick of plywood or 1.5” dense plaster. Current discussions with the contractor have determined that the walls of the enclosure will be constructed with 1” plywood, 3.5” airspace, and 1” plywood. The airspace will be 50% filled with loose fiberglass batt material. Our calculations show that this assembly will achieve STC 38 which is more than sufficient. 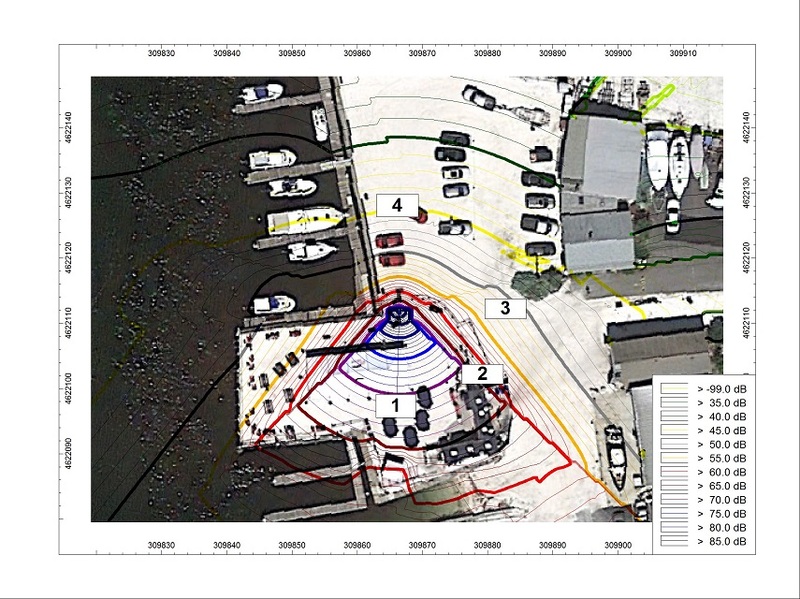 QSC K10 frequency response and directivity data were used in the modeling and adjusted to maintain a sound level of 73 dBA 50’ directly in front of the enclosure which is about the sound level of past music events at the clam shack. Figure 1 shows a close-up view of the resulting CADNA noise contours with the previous modeling assumptions. By way of reference, the red line is 65 dBA, which is around the level of human speech at normal conversation distance. Sound levels directly behind the enclosure (to the north) drop off quickly because of the directivity of the enclosure. Figure 2 shows the same noise contours but zoomed out further to include several locations where people have previously complained about sound. Figure 3 shows the previously modeled Bose sound system used last season with the same complainant locations. Comparison of these two figures show a dramatic reduction of sound levels to the north, east, and west. Table 1 shows the CADNA results at the various complainant locations which shows the differences between Figures 2 and 3 at each location. Improvements range from 8 dBA to 16 dBA which would comprise a dramatic improvement. A 10 dBA reduction would be perceived as a halving of loudness. Some of the predicted sound levels would presumably be well below ambient sound levels and perhaps inaudible. However, it is important to note that environmental sound levels can vary significantly due to weather conditions, fluctuating ambient sound levels and the inherent variation in music sound levels. Consequently, while the CADNA predictions are good from a design perspective, actual levels will vary from them to some degree. Regardless of the improvements afforded by the enclosure, a limiter will need to be installed as part of the new sound system. The limiter can be set to maintain a strict maximum sound level. An example limiter can be found at https://www.sweetwater.com/store/detail/SP24--bose-controlspace-sp-24. The limiter and small mixer (e.g., 8 channel rack mount mixer) should be mounted in a small rack which would have a lockable face plate, so settings cannot be tampered with. One of the next steps will be to test the enclosure concept with the K10, pre-recorded music, and then live music. Sound measurements would be performed to reasonably verify the predicted sound levels shown in Figure 1. As part of these tests, it is recommended that staff visit all the complainant locations to report back how audible (or not) the music is. Once the enclosure concept is verified and live performances resume, it is recommended that some sound measurements be conducted to confirm adherence to the predicted levels. 1. Pink Noise- steady test signal to evaluate the performance of the enclosure. 2. Live Music- same test as 1, but with time varying music level. 3. 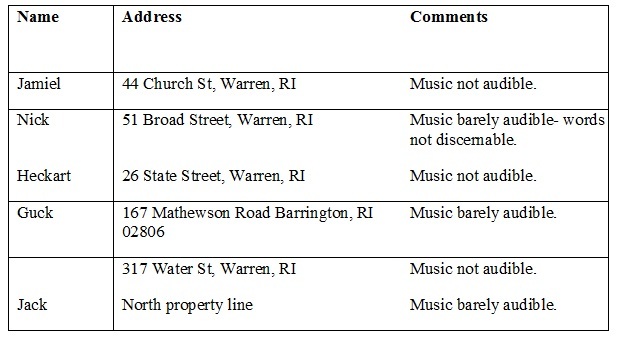 Live Music- Listening tests at each complainant location. Pink noise is a flat frequency response and non-varying test signal which was used to evaluate the enclosure performance. Four measurement positions were employed which are shown in Figure 4. Each position is 50’ from the QSC K10 loudspeaker. The pink noise level was set at 73 dBA at position 1, which is representative of past music performances. This test is generally more accurate than the music test because of the consistency of the test signal. Next, the same procedure was performed with live music- amplified acoustic guitar and vocal. Table 2 shows the results of the tests as well as live music at the property line. Predicted CADNA results agree well with the measured data. 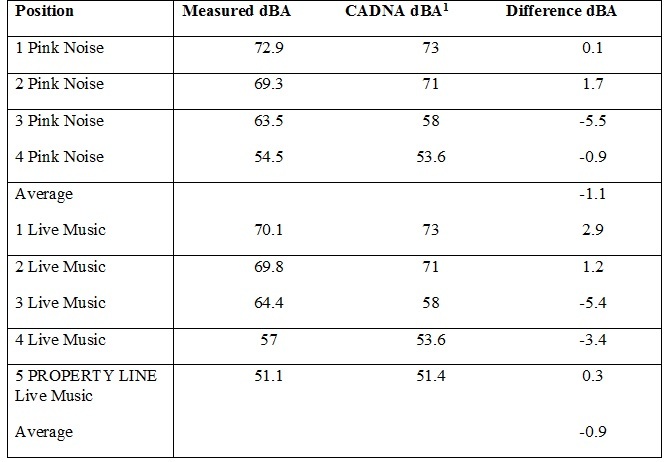 Good agreement is defined as ± 3 dBA, and the overall average is less than 1.1 dBA. This finding provides a solid basis for the predicted sound levels shown in Table 1, which comprises a dramatic improvement relative to the non-mitigated previous music performances. The final step in the testing was for Clam Shack staff to visit the locations shown in Table 1 during the music tests. Table 5 shows the results of this test. The results of the test range from the music being barely audible to not audible, which is in keeping with the predicted dramatic improvement. However, it is important to note that “audibility” should not be the acceptability criteria for this type of environmental sound issue. Under certain conditions, music would likely be audible. For example, as ambient sound levels drop during nighttime hours, the masking effect of ambient sound diminishes and often exposes the music signal more clearly. Other issues affecting audibility include varying music levels, wind and other meteorological effects, enhanced sound propagation over water, and people’s varying hearing thresholds.